A pottery jar of globular form, the rounded sides curving inwards toward the top and terminating in a short lipped rim, which has a downward sloping flange on the inside. The exterior of the jar is stamped with a repeating linear combed pattern, composed of squares that overlap in places. The jar has a slightly concave base. The pottery is unglazed and shows the greyish stoneware body. This vessel is distinguished by its robust shape and crisply stamped repeating combed pattern. 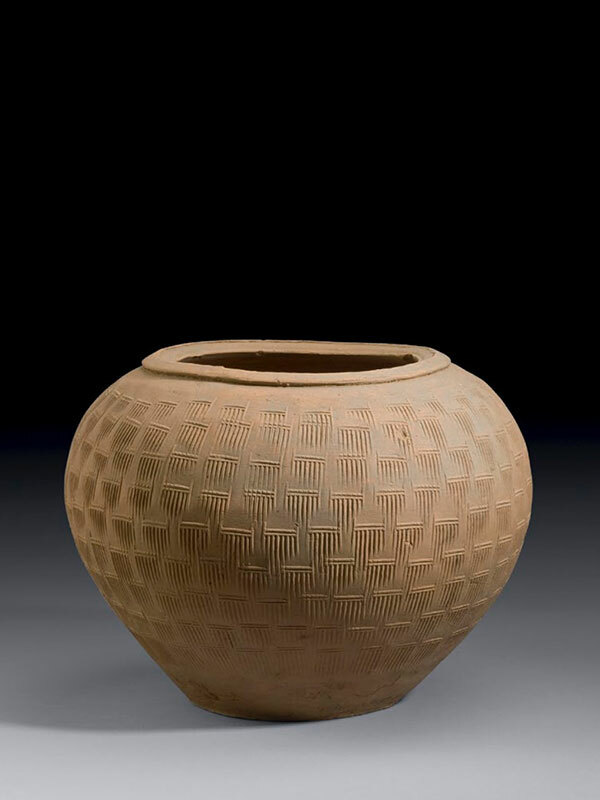 Unglazed or glazed high-fired earthenware jars stamped with geometric patterns were adapted from earlier bronze prototypes and made in Zhejiang province at the end of the Warring States period (475 – 221 BC) and throughout the Han dynasty. Combed patterns such as this have been found on pottery at Shangyu and Ningbo, both located in northern Zhejiang. An unglazed pottery jar with an everted mouth rim but with comparable decoration, which according to Krahl was ‘…impressed with a rectangular stamp or paddle to form a diaper pattern’, is in the Meiyintang collection. There are also a number of partly glazed pottery jars. One example, with remnants of greenish-brown glaze, is in the collection of the Baltimore Museum of Art. Another similarly decorated and brownish glazed Eastern-Han dynasty jar is in the collection of the Zhejiang Provincial Museum. A further related Eastern Han glazed jar with impressed squares containing a waffle pattern is in the Jiurutang collection, Hong Kong.